Once you start working on a project, you soon fall into trap of getting pulled in multiple directions. Building the basis of effective stakeholder communication is the first step you need to take to help everyone collaborate with ease. Before you delve into your project, it’s essential to clearly define who your stakeholders are. Stakeholders are all the parties involved in the project who either gain or lose depending on how successful the project is. Although most of your stakeholders are equally critical to project success, overlooking the issues that may arise due to bad stakeholder communication can be a serious project killer. An owner - someone who has the ultimate responsibility for identifying, analyzing and controlling project risks. They need to be continually updated about the project risks so that they can react before anything derails the project. Also, since they are responsible for directing the strategy and development of the organization they need to have regular weekly reports about what’s happening at any given time. A project manager - works on a small or a large team with a variety of job duties ranging from project planning to working with budget and timeline. To be able to communicate their ideas to the team, a project manager needs to have an insight into who is doing what on the project. Also, they need to be well-aware that different individuals communicate on a different level and that keeping the communication flow is critical for achieving positive results. A team leader - is, as the name itself suggests, responsible for creating a thriving team culture that is focused on one goal - how to reach the best possible outcome. A team leader doesn’t only have to communicate openly and honestly with the rest of the team but they also need to take necessary actions whenever they feel their team is walking on thin ice. A team - at its core, helps you turn your vision into reality. They are the main and valuable mechanism that keeps the project moving even when the times are tough. Their satisfaction and happiness are what keeps the mechanism going and should, thus, never be underestimated. It’s important to realize your team’s potential and encourage them to tackle mission-critical initiatives. Naturally, all of this wouldn’t be possible without effective communication within a team. To unleash their productive power, each member of your team should have a clear overview of their duties and focus their attention on doing their best and bring value to the team. A client - a crucial ingredient of every project development. There’s no doubt that the success of the project heavily depends on how well you manage your client's expectations. At the end of the day, it all comes down to whether the client is satisfied with final results or not. Keeping a client happy when things are going well is much easier than when times are tough. To build long standing client relationship, you need to nurture your client communication and provide your clients with regular reports on all the activities, changes and updates. Things get even more challenging once you start working on multiple projects at the same time. Not only do you have to juggle all the looming deadlines but you also need to meet all your stakeholders’ expectations without jeopardizing any project. But, everything gets much easier once you start using one centralized hub - a place where you can easily navigate all the projects and manage all the people who are actively participating in their development. 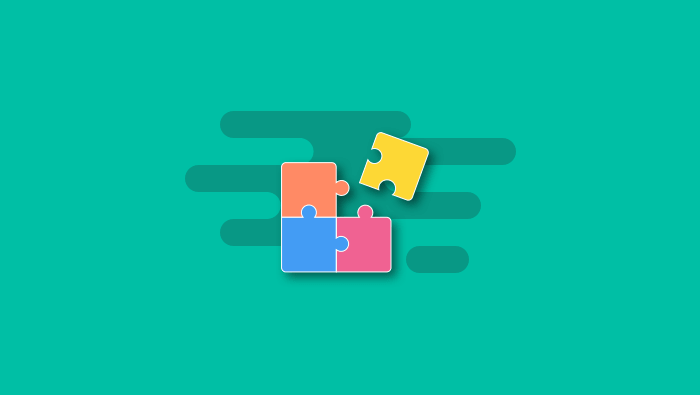 To keep the balance between talk and action, and synchronize all the stakeholders with multiple projects, we have created one centralized place in ActiveCollab, where all the magic happens. If you are the owner of the company (or one of the owners) you will obviously take the role of the Owner. 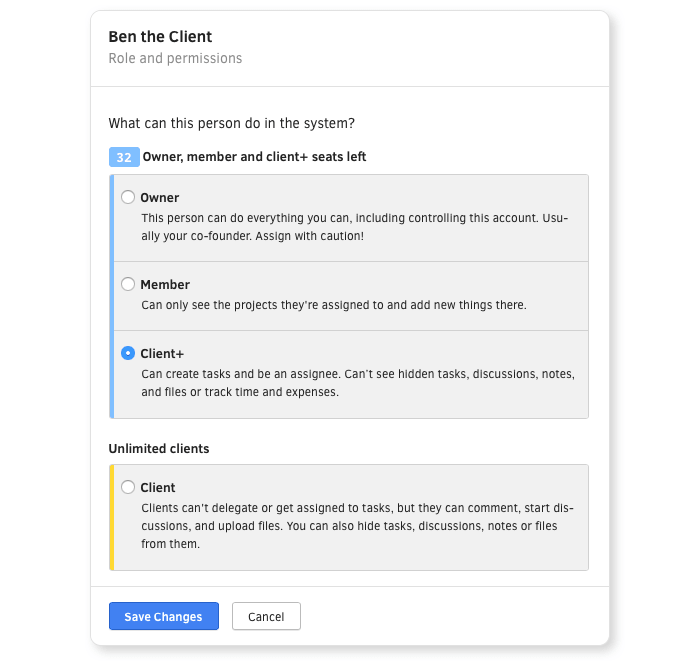 This will give you full control and enable you to track all shared files and documents, follow discussions and control all the activities across projects at any given time: from delegating tasks to creating reports. 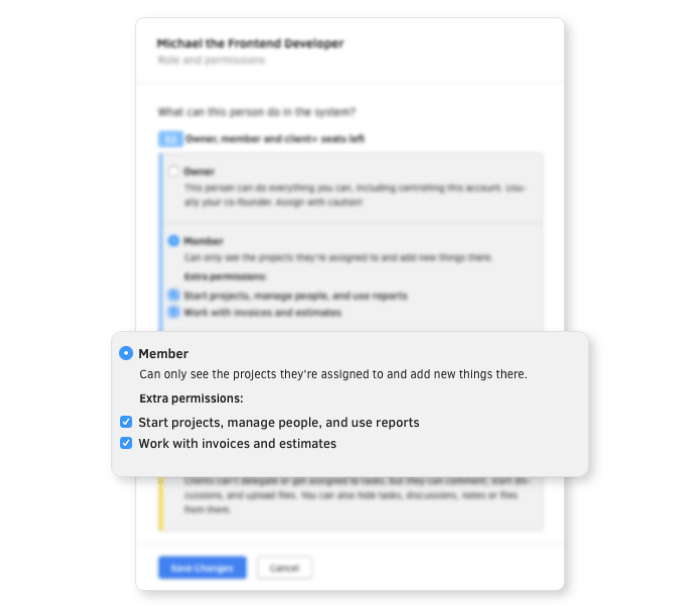 If you have a project manager on your team, invite them to ActiveCollab and assign the role of Member+ to them. 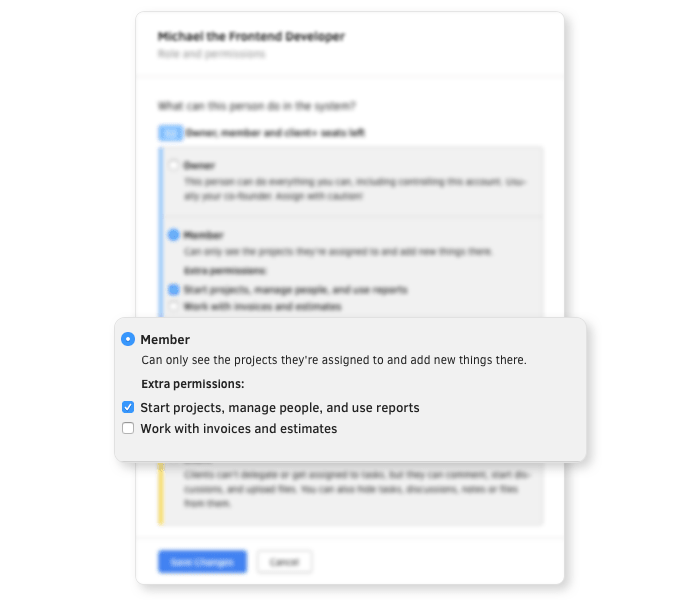 Member+ role gives the project manager ability to initiate projects, control and delegate tasks to the team. Plus, they have free access to all the invoices and time estimates created by each member of the team. Team leaders are also allowed to have Member+ role but without free access to invoices and time estimates. 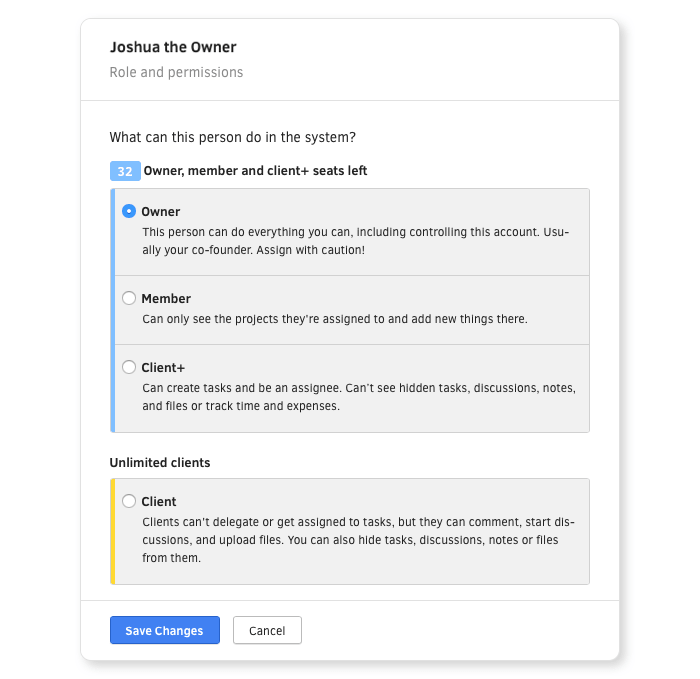 However, they can easily track who is doing what on the project and, if necessary, reorganize the workload so that every team member is assigned with an equal amount of work. loop and get regularly updated about anything that brings value to further project development. Once you involve your client in the project, they can track all the process as the project develops and provide their feedback as the project progresses. 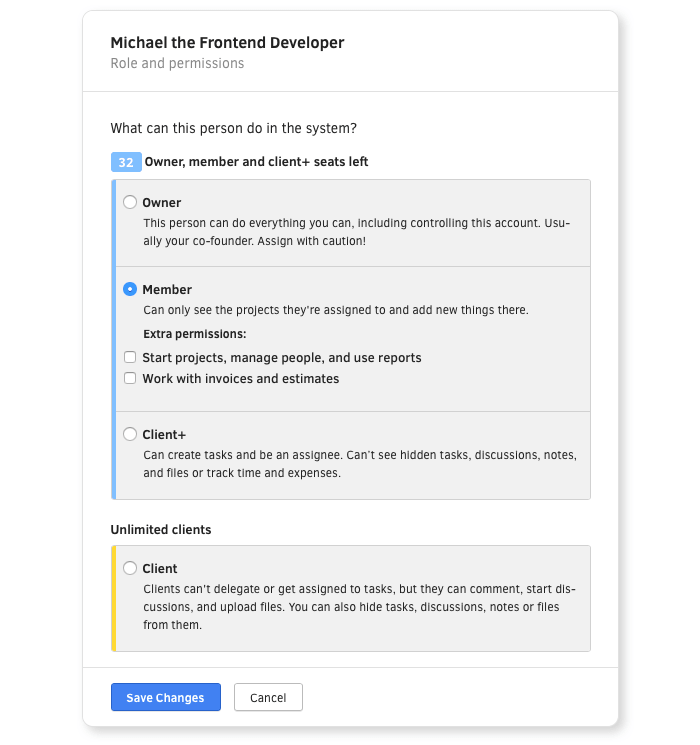 On top of that, they can comment directly on the tasks, trigger discussions and insert files. In case there are some difficult clients you need to handle, you can easily hide any details that you don’t want them to see. However, clients don’t have the possibility to create tasks. 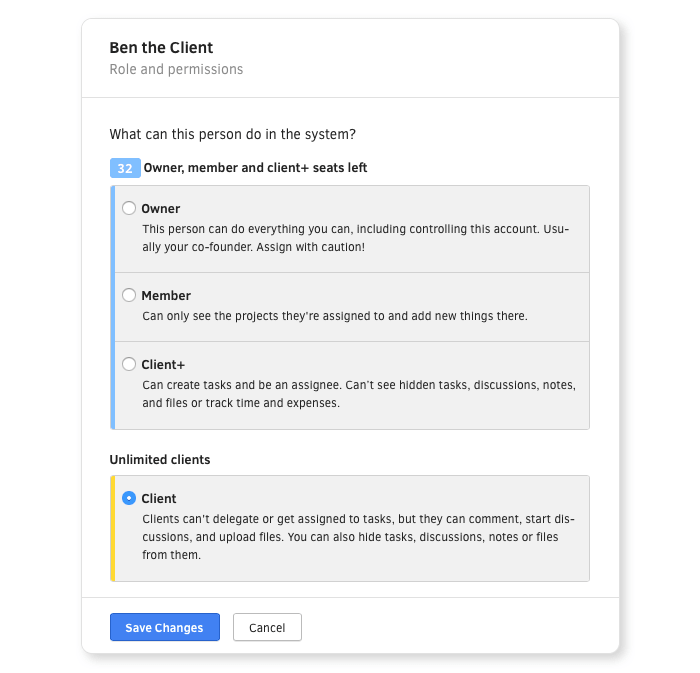 If, you have a productive client who wants to become an integral part of the project you are working on, you can assign the role of Client+ to them. This lets them create tasks and take particular tasks on themselves. What distinguishes them from other standard members is the possibility to hide sensitive data such as particular files and discussions you don’t want them to see. There’s no doubt that the project success hugely depends on whether it meets the stakeholder expectations or not. That is why you need to clearly define not only who your stakeholders are but also what their needs and requirements you have to focus on. Bringing them all together to one place where they can easily create tasks, follow activities and have regular discussions will help them stay on top of everything they work on.